Ron really encourages us to spread our artistic wings, try new techniques, sculpt new flowers and create new flavors. Often this happens when we meet with a client and wants something really unusual. Most of the time when we figure new things out, it’s when we get commissioned to do new work for a photo shoot or a specific event, most of the time these kinds of things have specific requirements for a story. Last week, one of my favorite planners, Xochitl, from Always a Bridesmaid called us up to collaborate on a special story for Style Me Pretty. We love them both, so we are thrilled to be collaborating on their project “Inspiration to Reality”. A wonderful wedding photographer, Heather Waraksa, will photograph the story. We received the inspiration board from them and they were requesting a design with the feeling of something edgy, urban and pop art. So I reached out to my production room manager Jason and asked him what he thought. He immediately went to the artist Jackson Pollock for his inspiration. The paint splatters with bold hits of color would fit nicely with this story. Keeping Ron’s challenge in mind, Jason took this whole design to the next level where he wanted the splatters to look inlaid like tiles into the cake. 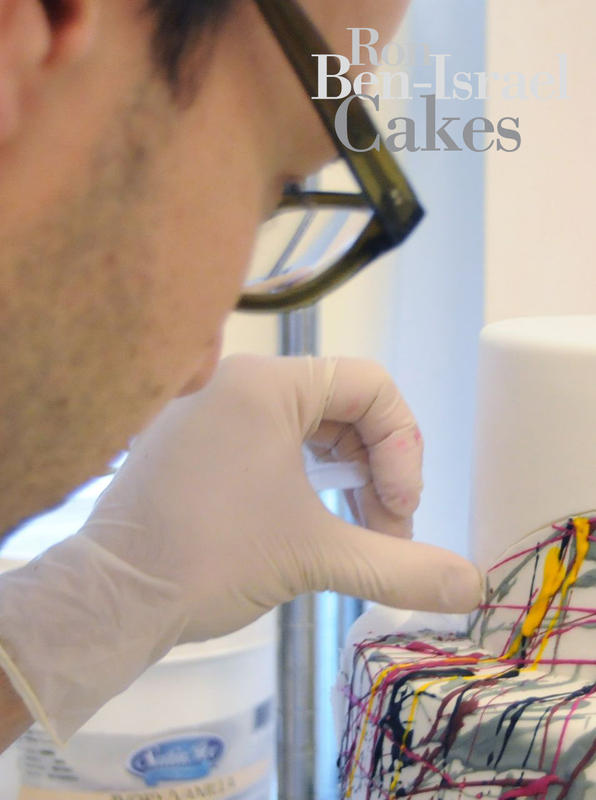 It took him a few days to figure out how the “pieces” would fit together, how to develop the splatters into an edible form, how to keep the cake a pristine white and how to still keep it in our style. Jason did figure all of these things out. I would love to share it with you, but I am not going to, how else would we remain unique! But I do want to encourage you to stretch the possibilities, experiment with design and figure out something new. These are all things that give you an edge in this very competitive industry. Jason working on his splatter cake. It really does have the feeling of a Jackson Pollock painting! Our story will be shot next week and we can’t wait to see it on the Style Me Pretty blog! It does! Congrats as always. ← A game that we play….what is Ron writing now?